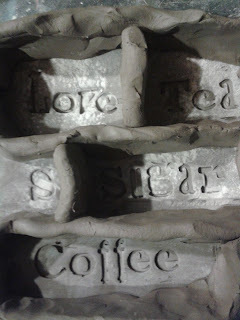 I made some stampers for the coffee and tea caddies. I'd have like some different lettering, as these weren't easy to remove from the clay after pressing in. I did dab talc over the clay, which helped a little. hopefully i'll have some pots to use these on soon. Hi David, we've been trying to find a way to release our Potclays P stamp from the clay sample tiles we've been making, and found good old cornflour did a great job without affecting the fired finish as it just burns away. Try it! Thanks Becky, I'll give it a try!